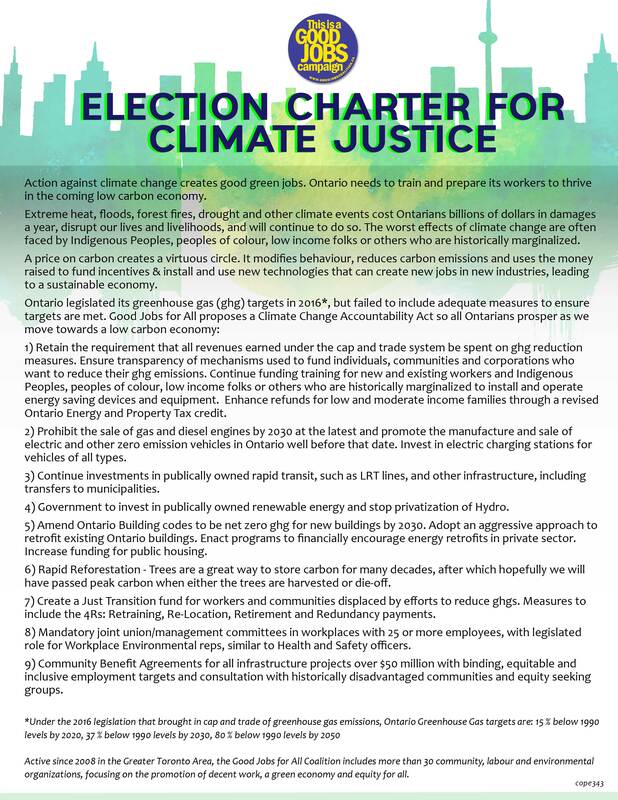 The recent flood events in Toronto that have effected road and public transport, the summer heatwave, and ongoing fires in Northern Ontario and BC show that despite retorts from the Tory provincial government to erase Climate Change from government documents, Climate change needs to be addressed if we are to have a livable city. Addressing this means that we have to transition to a green and sustainable economy and one that prioritizes human needs and addresses the human costs of this transition. One of these costs is to help transition workers trained for the fossil fuel based industrial economy to retrain or provide benefits that aid them in a transition to an economy based on renewable energy and phasing out of fossil fuels. This transition has to begin by meeting the economic and social needs of workers and the priority is to address the declining share of income in Etobicoke North and Ward 1. A Socialist Action resolution called for an increase in the living wage to help workers meet rising housing costs. I advocate and will mobilize for a living wage in Toronto of $20.00 per hour to help workers meet costs of living in Toronto. Any infrastructure work or other work done for the City by contactors should pay their workers at a starting living wage rate of $20.00 per hour. Workers are struggling to live in this city working long hours just to pay the rent but those on Ontario Works and Ontario Disability Supports Program have an even harder struggle given the recent cutr backs in the increase to social assistance rates. We need to demand that the City ask the province to roll back the cuts and implement a raise that actually would help low income on those on economic margins to live in the city and to prevent needless deaths due to homelessness. The City Council should call for OW and ODSP rates to $1500.00 for OW and $1850.00 for ODSP. Good Jobs and Climate Justice & Green Transition. Infrastructure projects, particularly those transitioning to renewable and green technologies present an opportunity for workers and communities. The Community Benefits Framework should be employed for all infrastructure projects over $50 million undertaken by City of Toronto with binding, equitable and inclusive targets and consultation with historically disadvantaged communities and equity seeking groups. Peter D'Gama is a member of Socialist Action and is committed to social and environmental advancement in municipal government.